XPO Logistics Inc. signed a lease for an entire warehouse at Gateway10 Business Park in Northeast San Antonio. The Class A distribution center broke ground in October and was completed in July. 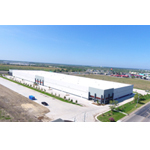 XPO will be occupying the first completed building in the development. The warehouse has a 32-foot clear height, 230-foot building depth, 38 dock-high rear-load doors, and 16 additional trailer drops. When completed, the park will include 1.3 million square feet of industrial, commercial and retail space.